There has been much attention paid to teams like Toronto and Colorado in the blogosphere and rightfully so, they have been interesting case studies for low possession/high PDO teams bound for regression. Today I wanted to take a look at the other side of the coin. The Minnesota Wild are primed for the other kind of regression. The Wild are a fantastic possession team. They have an 8-7-0 record in an extremely tough Central Division. Minnesota is currently in fifth place and is on the outside of the playoff picture looking in. Before the season I did not have Minnesota as a playoff team, but I believe I have misjudged them. The reason I misjudged them is because I did not think that they would be an elite possession team. Right now they are the best team in the NHL with a Score-Adjusted Fenwick of 57.79%. This is amazing and will eventually lead to more success in the win column. To me the process is more important than the end results over the course of a long season. Right now the Minnesota Wild are doing a great job with the process. I expect positive results to eventually follow. A team's ability to suppress shots is one of the best predictors of future success and the Wild are the best in the NHL at it right now. One thing that can absolutely kill a team who is great at possession is poor goaltending. The Minnesota Wild goaltenders need to be better. The Wild rank 27th overall in the NHL with an EVSV% of .901%. This is brutal, on any given year the league average for EVSV% fluctuates between .921-.923%. To put things into perspective the Wild ranked 3rd overall in the 2013-14 season with an EVSV% of .933%. The Wild don’t need excellent goaltending to be successful but they do need league average goaltending. They are currently receiving abysmal goaltending. The good news for the Wild is that Josh Harding is nearing a return. Even if Harding is not playing at the high level he was in 2013-14 I find it hard to believe that the Wild will continue to get .901% goaltending at even strength. Only the Buffalo Sabres (5.4%) are worse than Minnesota’s 8.3% power play in the NHL. The Wild have talented players on their roster. Their power play percentage will not continue to be this low. Eventually goals will start to go into the net and will start to complement Minnesota’s excellent even strength play. 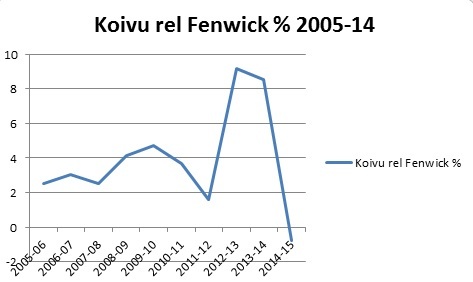 Koivu has been an underrated player in Minnesota for quite some time. He is an excellent possession player and has always been able to provide a decent amount of offense. Seeing as though Koivu has been one of Minnesota’s best possession players over the years it seems strange that the team is doing so well on the possession front while Koivu is not. Koivu only has 4 points in 16 games so far this year. This is a far cry from his 0.74 points per game average throughout his career. I don’t believe Koivu’s “struggles” will continue as the season wears on and when he starts to play better the Wild will improve even more. When you combine Minnesota’s elite possession with better goaltending and an improved power play you will start to see results in the standings. I don’t believe it is a matter of if, I believe it is a matter of when they start to see tangible results in the standings.